Throughout history, there have been many civil rights movements that have had a profound impact on our country. These movements affect everything from culture and society, to even the mindsets of the general public. We know the names of activists like Dr. Martin Luther King Jr., Malcolm X, and Elizabeth Cady Stanton, but there are some movements and people who tend to go unknown, despite their pioneering efforts to bring equality to all. The Americans with Disabilities Act of 1990 is no less spectacular than its movement predecessors, and was instrumental in providing accessibility and equity to people of all abilities. But the ADA would be nothing if it weren’t for the activists and supporters that held their ground in the fight for equal rights. Able Care Group is going to spend some time paying tribute to this incredible historical movement, one that helped us redefine what ability and equality truly mean. 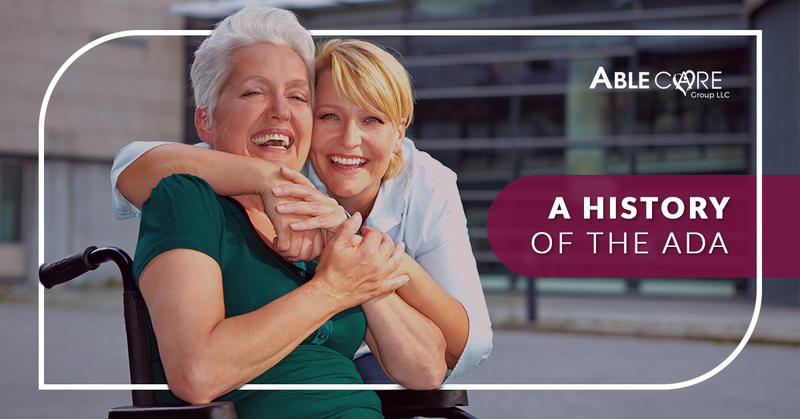 Take a look at the history of the ADA, and contact Able Care Group for a wheelchair ramp, stairlift, elevator, or platform lift installation for your home or business. It’s nearly impossible to think that this movement was still in motion less than 30 years ago. For almost the entirety of the United States’ history, our country was designed for people without disabilities. This might have seemed fine for the majority of the population, but for millions of people of different abilities, life was not only a struggle — it was a place of significant discrimination. People who used wheelchairs could not access certain businesses, the visually impaired had no Braille references in public, such as to indicate where the bathrooms were, and virtually anyone with a disability was not guaranteed a job — they could be turned away solely due to their disability. There was severe inequity happening for people with disabilities, and this needed to change. Judy Heumann developed polio when she was a baby, and subsequently used a wheelchair for the remainder of her life. What she quickly learned was that while her wheelchair allowed her to get around and go places, it was, ironically, a source of limitation in the eyes of the public. Her local school didn’t allow her to attend, calling her a fire hazard. After completing all the necessary work and certification to become a teacher, she was denied by the state of New York, again being referred to as a hazard. In 1970, Heumann started Disabled in Action with several of her friends, a group that was committed to bringing equal rights to people with disabilities. In 1977, many other disability activist groups were angered that the US Secretary of Health, Joseph Califano, didn’t sign regulations for Section 504 (of the Rehabilitation Act of 1973), which worked to protect the civil rights of those with disabilities. This led to nationwide protests and sit-ins at federal buildings to nonviolently fight against this legislative discrimination. For 25 days straight — the longest sit-in in a federal building, ever — Judy Heumann, her personal assistant Patrisha Wright, and 150 others did not leave the fourth floor of a federal building in San Francisco. The attitude of the federal workers and employees began to shift, seeing the resilience and fortitude of people who were tired of having to fight at every turn, just to get through life. The sit-in ended on April 28th, 1977, when Califano finally signed the Section 504 regulations that he had once refused. This was a huge victory for the disabled community, but truly it was an enormous step in providing protections and rights for everyone, regardless of abilities. The Section 504 regulations were the first series of laws that granted some protection to those with disabilities. It would be another 13 years for the ADA legislation to be drafted and passed, which was another crucial win for the disabled community. The ADA is a more inclusive law that offers “more robust protections against discrimination,” as explained by The Smithsonian, and it’s one that would not have existed if it weren’t for Judy Heumann and the hundreds of activists who fought back in a world that didn’t expect them to fight at all. Due to their tremendous contributions, people, regardless of ability, are ensured the rights of accessibility and equal employment opportunities, as well as the right to be regarded as capable and necessary humans. Whether you’re trying to make your business ADA compliant or are needing a platform lift, stairlift, or wheelchair ramp to make your home feel like home, Able Care Group in New Jersey can provide you with the mobility solutions you need. Every person deserves to live their life to the fullest, and Able Care Group is committed to helping make that happen. Contact our team of specialists to get efficient and professional installations for your New Jersey home or business — we look forward to hearing from you.